Something strange has been happening this term with students trying to access my recorded lectures in Flash format (e.g. CHEM241). At first it was Mac users, which was surprising because I know that there was not a problem for at least a year before that. Then I noticed that I could no longer access Flash recordings using Firefox. Since I also offer my lectures in m4v format viewable in iTunes or with a Quicktime player, Mac users could still get access to the video content. Also the Firefox problem does not show up on Internet Explorer. Once again, here is an example where taking the time to build in a redundancy really pays off. But it is still annoying for everybody. Tim will have to write a script to fix all the affected files this weekend. Given Camtasia's popularity, I imagine a lot of people will be impacted by this. The problem seems to be limited to Camtasia 2. According to Kevin Owens, the Flash files produced by Camtasia 3 (and presumably 4) work fine on Macs. I think the Firefox on PC issue only popped up recently so I assume it is related to the Firefox 2 upgrade. Pedro Beltrao just posted about the Journal of Visualized Experiments, publishing videos of biological experiments. Submissions are supposed to be reviewed within 2 weeks and it is Open Access. It really is true that we can save an awful lot of words with a quick video or image when reporting experiments. Even for ostensibly simple procedures like distillation it is amazing how everyone in our group had different assumptions about a "standard setup". In these cases the pics were invaluable to fill in for everything not said in the log. Videos are usually even more useful because the dynamics of a reaction can be ascertained. We have found that YouTube is a good place to post these because it is a public hosted site and the delay in showing up after uploading is just a few minutes usually. Google video can host much longer videos but it can take days to be accessible. I can hear some cringing because this does not immediately move us towards the use of the semantic web to do science and facilitate automation. But lets not forget that the first priority for a scientist has to be effective and efficient communication of what they have done and it is hard to top the message richness delivered through video. Even explaining the analysis of an experiment is really convenient using an audio/video interface (a screencast to be precise). We're about midway through our Fall term at Drexel and the students have just completed their first extra credit project in my organic chemistry class. In the Spring term, I had given my students a few options, including doing a blog assignment relating a research article to some concept that they were learning in class. In order to maintain a reasonable quality on the blog and help the students learn, I would give feedback using comments on the blog right up to the deadline when no more changes were accepted. Although this worked pretty effectively in terms of the final product, when a lot of changes were required, it was impossible to follow the evolution of the process. This term I made a few changes to the extra credit assignment. First, I moved it to a wiki so that it would be clear who contributed what and how the post evolved. Second, the only option I gave was correlating what was learned in class with real lab research conducted on the synthesis of new anti-malarial compounds. This is a luxury that I now have because the lab notebook of my research group is posted directly in real time to a wiki. Here is the result. Six out of 170 students participated. I purposefully make the extra credit very low (1% of final grade) because this is fairly time-consuming for an instructor and I mainly want students who are already intrinsically motivated in this side of chemistry to participate. Remember that we are talking about undergraduates taking introductory organic chemistry trying to make sense of graduate level research work in progress. Imagine if teachers from around the world included updating Wikipedia as part of the process of evaluating student projects. Imagine if students from around the world made constructive comments about our lab work as it is being posted. Imagine if more research labs made their work in progress available for open evaluation. 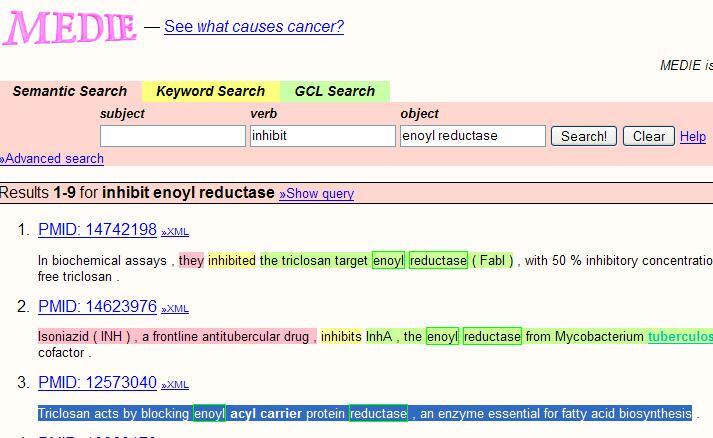 MEDIE is an "intelligent" semantic search engine that retrieves biomedical correlations from over 14 million articles in MEDLINE. 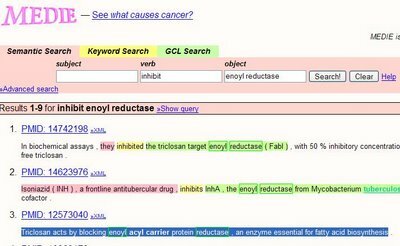 You can find abstracts and sentences in MEDLINE by specifying the semantics of correlations; for example, What activates tumour suppressor protein p53? Triclosan acts by blocking enoyl acyl carrier protein reductase , an enzyme essential for fatty acid biosynthesis. In this case, blocking is semantically equivalent to inhibits. It even color codes the subject, verb and object in the results! I wish this were available for chemical information, although QueryChem does something similar for molecule searches.